Baby shoes are nothing short of adorable, making it very tempting to whack on those mini Converse or Mary Janes the minute they’re born. But is this a good idea? Here’s the lowdown on when and what type of shoes to put on your little one’s feet. Babies have cute chubby little feet which are padded with fat and very flexible. While there are endless types of snazzy shoes available to buy from the moment your bub is born, it’s actually not a good idea to put shoes on babies who aren’t yet walking. Which is usually anywhere from around eight to 18 months of age. Their bones are very soft, and if you squash their precious tootsies into shoes too early you could prevent them from growing properly. Toddlers also use the sensory information in the soles of their feet to help them learn to walk and by covering them up in shoes too soon – especially if the shoes have hard and inflexible soles – you could be making it more difficult for them to learn and slowing down their walking development. Most toddlers are flat-footed or turn their feet inwards when they start walking and need all the help they can get until their muscles strengthen. Wherever possible, the best thing to do is let them go barefoot which will really help them to develop good balance, posture and coordination. 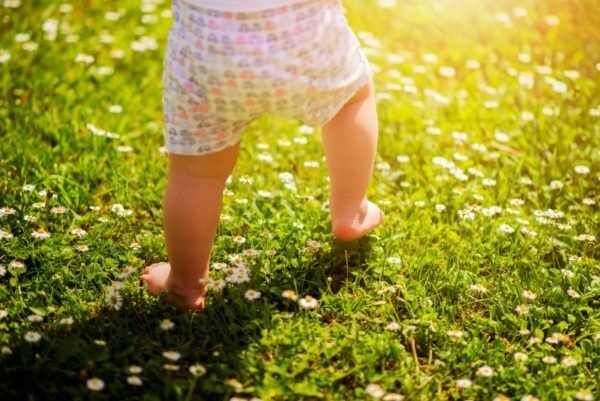 Toddlers should only start wearing shoes a few months after they’re confidently walking on their own, and even then, they should only wear them when outside – to protect them from sharp objects and weather elements (like hot asphalt or cold/wet grass). The only exception might be a special occasion such as a wedding or christening, where you might want to pop some cool kicks on your bub for photos (as long as they’re not too tight). When your little walker is ready for shoes, get both of their feet measured for length and width by a qualified shoe fitter at a shop. This way you can be sure they will fit properly and not cause any problems. Little feet outgrow shoes (and socks!) quickly too – around two sizes a year – so getting them measured will need to be a regular thing. Shoes which are too tight can cause bunions, in-grown toenails, blisters and hinder their ability to walk correctly; and often toddlers can’t or won’t tell you if they’re in pain. If possible, it’s best to buy new shoes for your walker to ensure they fit properly, instead of giving them second-hand ones that have already been moulded to another toddler’s foot. And once your baby has outgrown their first pair of shoes, don’t forget to keep them as a cute momento! When did your baby start first wearing shoes?